The Whole Brain Catalog is the Google Earth for the brain. Unlike the earth, however, there isn’t just one brain. There are any number of variations found across the brains of individuals and, of course, there are major differences between brains across species. For that reason alone, the “typical” mouse brain that the Whole Brain Catalog offers is just a start. It’s an impressive beginning. 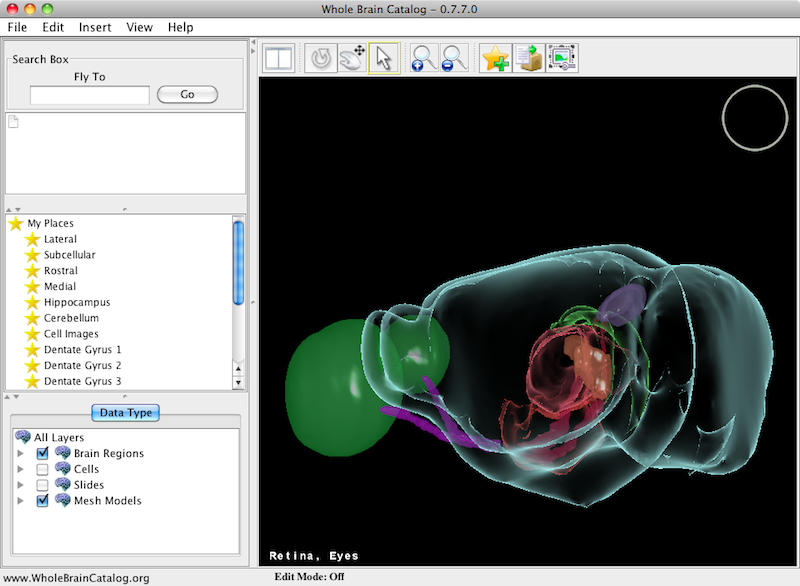 The standard lateral view of the mouse brain in the Whole Brain Catalog. There is a lot to explore in the Whole Brain Catalog so I’ll only attempt to introduce you to it here. Over the days to follow I’ll be highlighting different aspects of this important tool. Running the Whole Brain Catalog requires Java, a good Internet connection, and a relatively powerful computer. Most recently purchased laptop and desktop computers should run it just fine. Check out the requirement specifics and download the application from the Whole Brain Catalog Download Page. Note: Whole Brain Catalog is currently in what I’d call the alpha stage. Be prepared for some bumps. When the three dimensional mouse brain appears I recommend clicking on the “Rotate Camera” button above the brain and towards left and then grabbing onto the brain and rotating it around. Do this by pointing to the brain, holding down your mouse button, and moving the mouse. This should help orient you. While rotating the brain I found it helpful to zoom it out some (make it smaller). Click on the “Zoom Out” button above the brain and about in the middle. Then point to the brain, double click your mouse button and hold the button down on the second click. The brain will zoom out relatively fast as long as you hold the button. (Press once on your mouse button and hold to zoom slower. Use this when you’re working at a smaller scale like looking at single neurons.) Use the “Zoom In” button to the left of the “Zoom Out” button in the same way except that the brain will get larger. Once you’re oriented to the brain, check out how fun it is to fly around and explore brain anatomy. By default only a subset of “Brain Regions” and “Mesh Model” data are loaded. You can see the available data and data that has been selected to view in the area titled “Data Type” to the left of the brain viewer and at bottom. The default selections don’t come close to all of the data available even within these two high level categories. Keep in mind that the more data selected the longer it takes to download from the Internet. Also, with more data to handle, your computer may slow down significantly. Also take into account that the amount of data visible all at once on your screen may become overwhelming. Leave the settings on default for now and move your pointer over the brain. Notice the label changing at the lower left in the brain viewing area? This label displays the name of the brain structure that your mouse pointer is flying over. Click on the “Zoom In” button and double click and hold over the tangle of red (lateral geniculate body, optic tract) inside the brain. You can get close up and personal with brain structures. Tomorrow I’ll write about some of the data associated with these structures that you can work with and view. Meanwhile have fun exploring the Whole Brain Catalog, which may become the hub for accessing the broad range of brain relevant data distributed in repositories across the Internet. This entry was posted in Brain Science and tagged Brain Science, Open Data Repositories, Semantic Web on October 26, 2010 by Donald Doherty.